Well there's only a few weeks and it will be a new year - 2012. This year has been an eventful one. Poor Maya contracted cancer and had to be put to sleep. She is now over the Rainbow Bridge. It was very sad. Hoping I'll be back to running around soon! In about 12 months time I might be meeting a chicky babe and we might be making beautiful music together. Paws crossed .... I am waiting for my hip and elbow scores to come back from the experts to see if I am good to go. Maya will be so happy because I keep harrassing her. She is not interested in my advances which is quite hurtful. 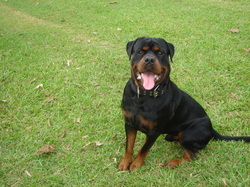 As a young active rottweiler I sometimes am a bit silly - well often actually. Mum sometimes says I am a boof head, or an oaf, or an idiot. But I think that's a bit mean really. Anyway luckily for me she is a qualified Canine Myofunction Therapist. What that means is I get massages. Hmmm, of course I do deserve them. They are sooo nice and they are good for my muscles too. They help prevent wear and tear, protect from strain, and are just pretty nice actually. Sometimes I'm known as Cairo the Conqueror or Cairo Chaos. Sometimes Mum calls me Cuddles. Anyway whatever she thinks ... I am actually super tough so I need a Super Tuff Heavy Duty Collar so I look the business. I like to play rough and I can take the hard knocks so I need a collar that's not mamby pamby but can take the hard knocks too and my new Super Tuff collar definitely does that. Not just that but I not only look super tough, I look super cool too and all the bee-atches dig it. My long down was faultless so I got all the 10 points for that. And my sit from a walk and down from a walk were good too. I stuffed up a bit with the recall though cos I didnt come in straight. Oops! 'Cause the onlead heeling was pretty bad cos my attention was definitely NOT on mum but we did pass so that's it for the BH. Onwards and upwards hey. Well it's been a while since I posted. After the disastrous BH a couple of months ago I haven't really felt like it. I really did stuff up although I maintain I cant be expected to keep my focus in The Group when something has bitten me on the bum. God knows what it was! Anyway mum says she is going to let me redo it in November in Brisbane. That should be interesting. Never been up there before so I guess we'll need some practise there first. We went tracking yesterday morning but the crows had eaten all the good stuff before I got there so I wasn't that interested to be honest. Mum's still learning it too so I think we made quite a few mistakes. Anyways I just had dinner (yumm..) so now I need a nap (yawn). Well, it's been a while since I posted. Mum seems to be mending a bit more now. She has taken us out for training and playtime. Dad took us to the beach and I walked all over him (as usual). I dunno why but I don't really listen to him - not the same why I do with mum anyway. Big news ... The Ginger Menace went missing. The hungry creature is always around at dinner time but not the other night. Mum was frantic. Can't see why though. Although I did miss having him around to torment! Mum put out posters and rang the RSPCA and Animal Welfare League, the Pound and loads of vets but no one had seen him. I know she was worried sick when she went for work but then he turned up (drats) out of the blue. Mum reckons he must have been catnapped or stuck somewhere. It's not the first time he's been catnapped either. Careless bugger. Anyway gotta go - I have to go and try and hump Maya. Although I don't seem to be having much luck there for some reason - even though I try and try and try. Mum says she is 'desexed' whatever that means. Doesn't sound very nice that's for sure. Nevertheless I have still had some fun today. Chasing the cats is great although I have to be careful not to push it too far because those claws are sharp. I also lifted my leg on the chair on the veranda. I know I'm not supposed to but I couldnt be bothered to walk down to the grass. Hehehe ... I got told off but it was too late then, wasn't it?! The little white ball of fluff that lives two houses up was in the next door neighbour's yard again. Her name is Sheila! What sort of name is that for a dog? Bloody insulting if you ask me. Anyway she runs up and down the fenceline yap yap yapping. It is so annoying so Maya and I went down and showed her what a real dog sounds like. Ha, that showed her! Mum sat in the backyard with us for a while and Maya and I played with the ball but now I am waiting for her to take us back down there. I have so much energy and I dont know what to do with it. Maybe I'll dig a hole or something. I could always pee on the sheet hanging over the veranda rail. That would get a reaction ... hehehehe. Well, hi everyone. As you can see from the info on the side my name is Cairo and I'm a rottweiler and not afraid to admit it. Anyway I can't hang about writing this right now. Mum's been sick all week and I haven't gone out for a walk for ages. I'm only 17 months old so I have LOTS of energy and I need to burn it off before I do something Baaaaad!!! Mum says she's going to come out to the backyard with me and throw the ball around until she collapses (or I do - whichever comes first). By the way, that's me as a puppy in the photo above. I'm a big boy now! My name is Cairo. 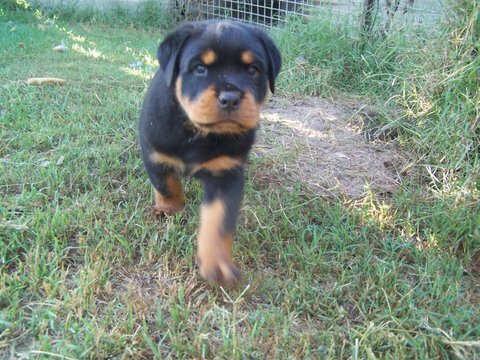 I'm a rottweiler and proud of it. I'm nearly 18 months old and I live on the Gold Coast with my pack which includes two minions who ensure all my needs are taken care of (especially mum) and two feisty felines. I am learning Schutzhund which involves tracking, obedience and protection. I really like it but I could probably try harder. Life's pretty good actually. We even have a swimming pool which is great in summer.